Cash strapped high school athletics programs are exploring new ways of generating funding. Rocklin High School near Sacramento, Calif., recently installed a new fixed digit scoreboard with a Watchfire video display to provide a better live experience for fans and to give sponsors and supporters a way to advertise. 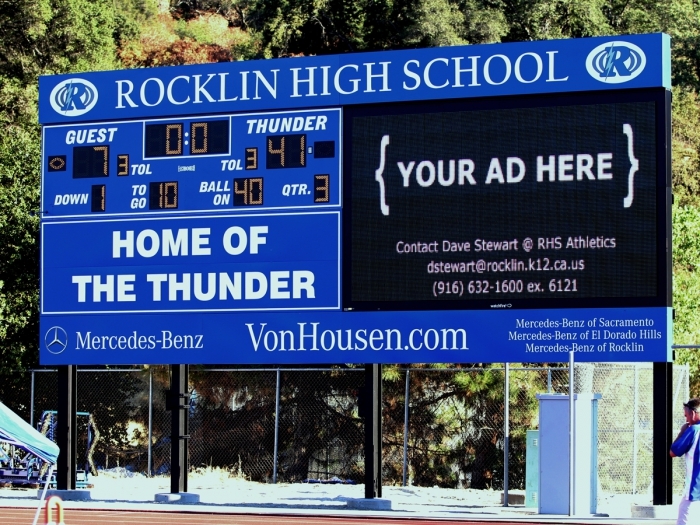 Rocklin High School, near Sacramento, Calif., has a new state-of-the-art scoreboard with a digital video display in its football stadium, thanks to the involvement of the local business community and active parents of student athletes. The 15’ x 35’ scoring system was designed and installed by Hupp Signs & Lighting and includes a Watchfire digital display. The Watchfire LED video display is designed for outdoor use featuring high-resolution images. It can display full-motion video at up to 60 frames per second and is being used to display live video and advertising during events. Rocklin High School is using the digital sign to generate advertising revenue for the school from sponsors, as well as to incorporate learning opportunities for students. “We used to sell team sponsorships and recognize sponsors on banners in the stadium. Now, our sponsors get terrific exposure on the video board at all our home games,” said Dave Stewart, Rocklin High School’s assistant principal and athletic director. Approximately a dozen students from Rocklin’s media class are involved in providing content to the board. “We have students in charge of four cameras at each game. They get hands-on experience learning to transition shots, providing slow motion replay and engaging the crowd,” said Stewart. The idea for the new scoreboard was hatched after the old board shorted out in the middle of an important football game last season. Staff at the school decided they wanted their new scoreboard to have video capability and discussed how they could fund it. Parents of athletes got involved and approached different businesses to help, including the Von Housen Mercedes-Benz auto dealership in Rocklin, which funded the project. The new scoreboard is a big hit with athletes and fans. Administrators are looking at other ways to use the LED board to raise funds for athletic programs, including movie night and concerts at the stadium. Read this guide to learn about revenue-generating opportunities that will self-fund your video scoreboard.